UPDATED: OCT 26, 2012 It’s impossible to make a good black and tan beer at home. The only way to get a truly good black and tan is at a bar (Guinness and Harp being the best choices to mix). So when I came across Saranac Black & Tan I was a bit skeptical. How could they have mixed the beers at the factory without it tasting odd? I was quite surprised to find Saranac Black & Tan does taste as it’s intended, with the heaviness, dryness and smoothness of a stout but with the clean finish of a lager. How they were able to cram all that into a bottled beer I’ll never know. The darker and heavier in body a beer is, the smoother it pours out of the bottle, at least in my experience. Such is the case with Saranac Black & Tan as it flows smoothly and quickly from the bottle to the glass forming a ½-inch tan-colored head. The head is a bit creamy and will linger throughout the drink with a lot of lacing on the glass. Since the beer is made from a stout, it’s no surprise it’s essentially opaque black in color. But if you look closely you’ll notice it’s actually more of a very dark, somewhat cloudy maroon hue. As for scent, it’s fairly dry and bitter to the nose. But once drank the aroma comes alive with all the varieties of ingredients that make up a very complex flavor. The bottle of Saranac Black & Tan actually challenges you to correctly identify all the different flavors present in this beer. What do you win if you name them all? Well, nothing, but you do get the privilege of drinking a very tasty beer in the process! 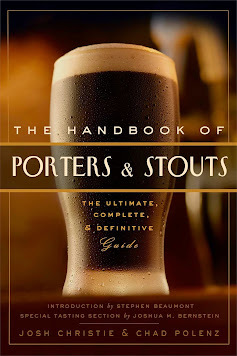 This brew contains many of the typical qualities of stouts, in that it’s dry and bitter but complex in taste. Much like Guinness, it is reminiscent of coffee, chocolate and deeply-roasted hops. In fact, this roasted taste is the most significant of all the flavors and carries the most weight. At least the beer is smooth and easy to drink, since it is half Irish stout, after all. It has very little bite to it and finishes crisp and easily. However, it’s a little strange drinking it, since it’s so dark you might expect it to feel like a velvety smooth stout, but the lager actually has more presence so it’s a little fizzy. Still, it’s nothing the average drinker can’t handle. As tasty as the beer is, its heavy body is what prevents Saranac Black & Tan from being a master brew. Stouts are full-bodied and full-flavored and lagers are just the opposite, yet this beer strongly favors its stout characteristics. As easy as it is to drink, it’s very quick to fill you up, even on an empty stomach. It would probably be a good beer to drink with a light meal, but it wouldn’t work well as a party drink. Fortunately, it’s only available in Saranac variety packs so two is most definitely satisfying. Just the thought of a black and tan in a bottle is enough to make the average beer snob raise an eyebrow. But Saranac Black & Tan is well-crafted and tasty enough to be appreciated by the most discriminating connoisseur. To the average beer guzzler it might be too strong, too bitter and/or too dry (at least at first), but they’ll very likely to warm up to it quickly.